Giveaway! Win the New Barefoot Contessa Cookbook How Easy Is That? 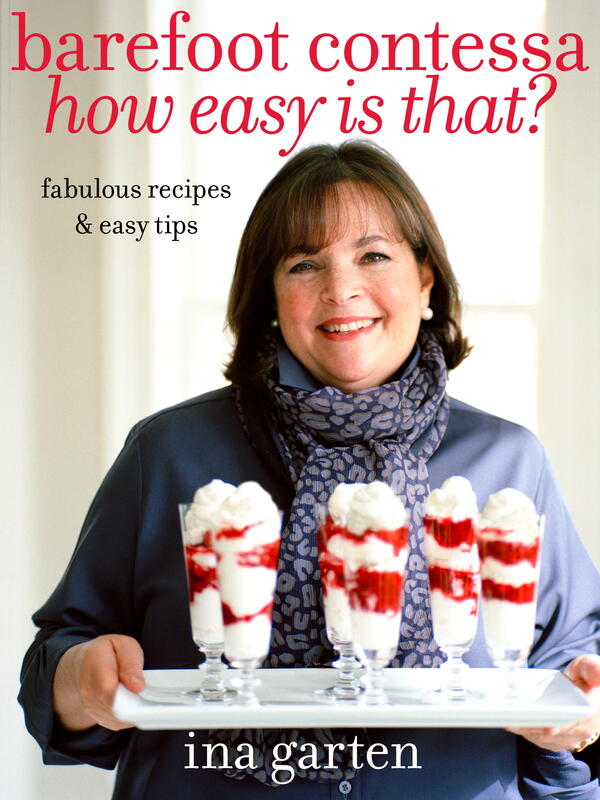 Ina Garten’s new cookbook Barefoot Contessa How Easy Is That? has hit shelves and I’ve got an autographed copy to share with you! The focus of her new cookbook is creating simpler yet delicious meals with few ingredients that save time and stress in the kitchen — every now and then we all need a little help don’t we? Leave a comment on this post telling me what your favorite Ina Garten recipe is and why. This contest will start November 1st, 2010 and end on November 5th, 2010 at 6pm EST. Winners will be chosen at random using Randomizer.org and will be announced the next day, only people in the United States are eligible. Winners will be emailed and will have 48 hours to respond with their mailing address or an alternate winner will be chosen. Filed under Do This!, Giveaway! Wow…what a great deal! Spread the word!!! I love Ina!!! Me, me, pick me! I am in desperate need of quick easy recipes 🙂 Her spring green risotto is one of my favorites. It is a comfort food with just enough veggies in it to call it healthy-ish. The dish is easy to make, yet comes across as a bit more sophisticated for company. Will do Kate — I’ll have to try that recipe. Everything is better with mustard! Thanks! I love Ina’s apple crisp! Just thinking about it makes me want to make some with fresh, in season apples… Yum! Will you have one waiting for your husband when he returns from his business trip? 🙂 I do love a good apple crisp — save me a bite. http://www.foodnetwork.com/recipes/ina-garten/salad-with-warm-goat-cheese-recipe/index.html I like THIS one…and I want to make it tomorrow. yum! By far, my favorite recipe is Ina’s roasted chicken over fall vegetables. Really great dinner for family or for entertaining … even picky eaters. Pair it up with the super fantastic Guyere mac and cheese and simple asparagus bundles and you’re the new hostess with the mostest! Mindy, those all sound like the perfect recipe for a cold, rainy Fall day (today in NYC!) Might need to motivate to the store and give them a try. Thanks! Me! Me! I love Ina AND 8.ate@eight!! Her chicken bouillabaisse is one of my favorites, though it is hard to narrow down. Now that winter is here, it is just the perfect thing for a slow cooking Sunday. I loved the pumpkin cupcakes; made them for two groups of friends and they were a huge hit! I don’t have any of Ina’s cookbooks and hope I can add this one to my growing collection. Those sound like the perfect Thanksgiving treat — might need to whip some up for the family this year! Thanks! this one is my favorite. – but mommy has to leave out the butter b/c i’m allergic to dairy. – i love ina- i’ve been watching her since I was 2 months old. Quite an avid fan at 2 months old! Good luck Charlie — I hope this becomes your very first cookbook! She has so many to choose from so here is a new one I can’t wait to try! Ina Garten has a way of making all her recipes sound so doable and they are. One that is very doable, but sometimes scares people is filet of beef. When she says roast for exactly 25 minutes for med.rare…that’s what you do and it is perfect !! I also love that she has so many pictures in her book…beautiful and helpful. Her Chocolate Ganache Cupcakes are wonderful and EZ. That’s what I LOVE about her. EZ!!! How EZ is that? Yummy too. My favorite Barefoot Contessa dish would either be the Roasted Fruit (soooo yummy and so good with pound cake and whipped cream) or my favorite standby, garlic roasted potatoes. I make the potatoes every Easter with our salmon, egg bake and caramel rolls. Delicious! Faerol, those both sound amazing and I haven’t tried either. Will add to my list of Ina recipes to make! Thanks! I love Ina’s Lemon Chicken with Croutons recipe from her Paris cookbook. I made it for my roommates and it turned out great. It was very easy to make too. I love her recipe for Maple-Roasted Butternut Squash. It makes a great fall side dish, and is so yummy! This was the first butternut squash recipe I’ve tried that everyone in my family liked. That sounds delicious Amy — I love Butternut Squash, so will definitely have to give it a try! My only complaint about her Chicken Pot Pie recipe and her Turkey Meatloaf recipe is that I can’t eat them every day. Well, I could, but I’d need to wear elastic pants. Love Love Love Ina. Given that it’s raining here today, those both sound amazingly perfect for dinner! Thanks for sharing! Congratulations Nora! The proud new owner of Ina Garten’s Cookbook How Easy Is That? I hope this inspires many delicious Sunday dinners. Thanks for participating and sharing the 8.ate@eight love. I love Ina’s Lobster Potpie recipe! She’s the best!